Here is a handout showcasing the important things to know when considering the implementation literacy centers. Why Differentiated Assessments for ELL? Differentiated assessment is vital to assess the learning potential of every student, especially those who come to class from a wide variety of backgrounds and circumstances. These students often felt left out just because their first language is not English. Using differentiated assessment will help us find out what they can do and what they need to become a successful learner. I am a strong believer in the concept of equity when it comes to education. It might seem like treating every student equally is best thing to do as a teacher. But It is about understanding the needs of each student and helping them to be successful in their learning. 2. allow students to demonstrate their learning in different ways such as visual presentations, oral presentations, graphic organizers, etc. Here is a video that talks about effective classroom strategies for assessing English Language Learners. I know its a long video but I hope you enjoy it and find it useful! Also, I found a book called Differentiating Instruction and Assessment for English Language Learners: A Guide for K-12 Teachers. Here is a link if you are interested in buying the text. In my investigation about technology in the classroom I have been focusing more on technology in the classroom and some programs that are used and are helpful for communication and different ways to learn through technology. This week I decided to think outside the box and look into one of my passions, which is outdoor education and how technology can accompany it. Firstly, technology speaks for itself because it is convenient. It all depends on perspective if we think it is good or bad. Sure there are some things that make people think that it is bad (ex. too much screen time, kids are on their phone too much, playing games). But on the flip side there are some positives as well (ex. sources of communication, differentiation for students, learning through games to spark the students interests). We typically think of technology as cell phones, laptops, iPads, and that is where the “problem” is with too much screen time. If we think about it, we use technology more than we think because we are so used to it. (ex. computerized banking at the grocery store, the automatic doors to and from the store, central heating, power windows in our cars, coffee maker, etc.). The world is constantly changing and we are stepping towards technology more and more each day. In outdoor education, we think that we are stepping outside and away from modern urban lifestyles and to connect with nature. In the article that I read they are comparing traditional and modern technologies in outdoor education. The traditional technologies refer to things made out of natural materials, where as modern technology is referred to something that is made synthetically. It is said that “we tend to understand traditional technology for the outdoors as that which helps the user of the technology to establish a certain mind set or a state of being” (Cuthbertson. B et al, 135). this type of technology, these pieces of equipment are used to enjoy the free-nature and the simplicity of living. On the other hand, modern technology is used to improve or reach a higher accomplishment where technology is needed. For example climbing ropes are used to help improve rock climbing and also is used for safety. These types of technologies have made it comfortable to be in the outdoors. Now that we have touched on those modern and traditional technologies, I am now going to look into digital technologies in outdoor education. In a case study, there were studies done on 183 students through the ages of 7-14. They were tested on their feelings about technology in an environmental observation. The classes that were observed were taken outside to make observations about the nature. They were split into two groups. They were observing their surroundings, specifically leaves. One group was using technology, specifically digital microscopes, which enabled them to be able to see all the bumps, veins, and colours. The other group was using a hand lens. The next activity they did was a journal session. The students wrote down what they noticed about the leaves, they also drew pictures. After they had finished their journal writing the two groups switched the microscopes and magnifying glass. In conclusion, the students that participated with the digital microscope felt more confident and had a positive attitude towards technology. It helped them better understand and observe the leaves. I also found a really informative video from a group of educators in Australia. They have been incorporating technology into their outdoor education. They are contacted through classroom teachers, where they will then video conference the class to inform them with what they will be doing. 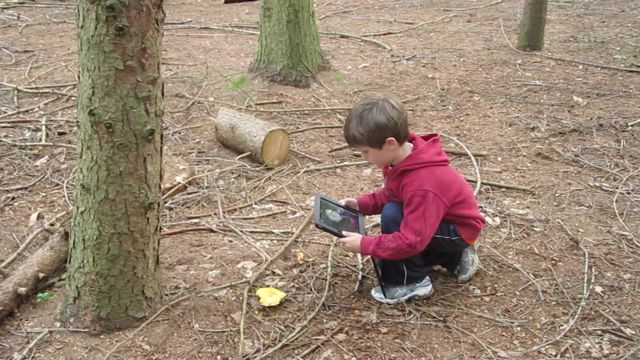 They used iPads for a bunch of different activities.They used a program called Digital Woodlands where they take the iPads outside and take photos to be able to tell a story. The outdoor educator said that a walk that would usually take a class 10 minutes, takes them and hour and a half because the students are climbing, crawling, and trying to capture as many interesting things as they possibly can. This allows the students to be more observant. They get to be creative in nature, analyzing and observing. It gives them a great opportunity to wander and they are proud of their work that they have done with their digital story. The students also had been taught some photographing techniques before this activity. iPads can also be used to make iMovies, which is easy on the iPad for children. Another application is called “Explore Everything”. It is used for the students to look for evidence in their pictures that they have taken and make a voice recording to explain what they observed. 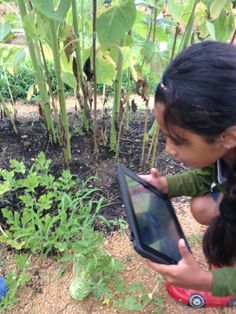 Math is another subject that can be explored outdoors. One class was measuring the height of trees. The students took videos of themselves explaining what they were doing and what methods they were using. They got to talk the way they wanted in their own words, which for students is important. The teachers also use these videos as a form of formative assessment. The outdoor educators set up an eco-mystery, where the students had to investigate why a frog had died. They used data loggers to test the temperature and humidity and had to investigate the area to see if that would have been a reason for the death of the frog. The students continued with the data loggers and observed the land to see if certain species could survive there. They also used Wildlife cameras (hunting cameras) to try to capture pictures of different species in different areas. When they captured a picture of an animal, the outdoor educators had mentioned how excited the students were. They also set up and used GoPro’s in their teachings. Another outdoor educator that worked with special needs students said that technology helped the students largely. She video conferenced with students to ensure them what they would be doing so they could have an idea and prepare themselves. She had also mentioned another student who was very terrified of birds, but when she showed a video to that student of the type of birds they would be interacting with, the student enjoyed the videos, so it helped that student prepare himself and get familiar. I really enjoyed this video and found it informative. I would highly recommend watching it if you are interested in incorporating technology in outdoor education. One good point that the was brought up is that most kids already know how to use iPads from prior knowledge. I also understand that a school might be limited to the amount of technology that can be used. iPads have been common in schools and there were some great ideas on how to use them. I think that students should be able to enjoy the outdoors without digital technology in “free time”. 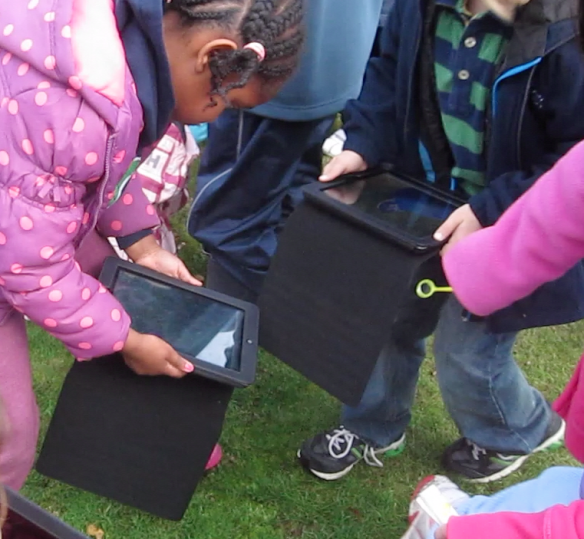 Of course each age group is going to be different with using technology outdoors. As the students get older there are ways that we can incorporate digital technology into outdoor education. I think that if a student was doing an inquiry project on something outdoors (ex. trees) I think it would be very neat for students to be able to take videos of different types of trees and incorporate those clips into a iMovie. It is another way to show their learning from the outdoors to indoors (of course for intermediate students). I think that there is something to be said about being able to enjoy the moment when outdoors, for example, when people are on vacation they want to enjoy the scenery without looking at it through their phone taking pictures and videos the whole time. I think that we need to give the students time to explore without technology but I think that it will be a very helpful tool to use. One thing that is very important for the implementation of Formative Assessment, is the language you use to report your feedback to the students. To this end I wanted to look into some effective language use to communicate feedback. One really important point that I have seen discussed in numerous different places, is effective and proper use of praise. Historically, praise was often used to uplift a student on their achievements and show them the accurately completed their goals. This lead to an interesting problem, in which students began to care a lot more about the receiving praise, than growing and learning. Students who are told “Wow good job, you are so smart”, are unlikely to continue trying to solve more difficult problems for fear of failure. This is called a Performance Avoidance Mindset. These are students who perform exclusively for extrinsic motivation; they want to be told they are smart, again and again. If they are forced to work hard on something in order to complete it, and do not receive the praise they were expecting or hoping for, they are unlikely to try again. And that makes sense. It also makes sense that if you are giving Assessment OF Learning, it is very likely you will give this kind of feedback; the student either did well or poorly, nothing else matters. However, if you instead say “Wow great effort, you worked so hard and this [insert specific example] part of your assignment was really great because of [insert specific reason]”, you are going to get a very different response from your student. This response is doing two very important things differently that the first example. One is very obvious, and that is the specificity of the feedback. Your assessment is showing that you really focused on something the student did well. The student can tell that you really cared about their efforts. And on the topic of effort, that is the second great part of this feedback. The emphasis on praise of effort over achievement has been shown to increase further growth and encourage a Growth Mindset, or a Mastery Approach Mindset. These students are highly likely to try something more difficult, or beyond their immediate skill level because they believe it really doesn’t matter whether or not they succeed, what matters is that they try their best and work hard. Of course this is not enough and it is important to inform students of how they can improve. At this point though, when you have a student who is already in the mindset of being prepared to learn and improve, any constructive feedback you give is more likely to be accepted as constructive and to reflect on it to improve. This is just one example of a way to use appropriate language for student feedback. There are many many things to remember when reporting to students. One of the most important points in the introduction of Formative assessment was its evolution from what came before it. For many years education was run off a system of Summative Assessment. Summative Assessment is also known as Assessment OF Learning. This is a pretty easy way of undertanding what Summative assessment is. It is generally a way of assessing student learning through their final assignments of tests. This is a very useful technique is a few ways. It is absolutely useful when making a final decision of whether or not a student has accomplished a goal. However, after years of exclusively assessing student work in this way, it became clear that this was not optimal. The main problem with Summative Assessment is that there is very minimal constructive feedback throughout the learning. As a result, by the time students receive their feedback, there is no room or time to improve on what they have been told. If the term/year is over, how as students supposed to take their feedback and learn from it? That is where Formative Assessment comes in. A second way of thinking about Formative Assessment is as Assessment FOR Learning. Again, this name says a lot. It was created specifically with the goal of filling in the holes that Summative Assessment left, i.e. assessing and providing feedback for students with the intention of allowing them to learn from and improve on their work and learning. This is a picture from the book “Classroom Assessment for Student Learning” by Rick Stiggins, Judith Arter, and Jan and Steve Chappuis. It is a table showing the differences between Assessment FOR Learning and Assessment OF Learning.